The UK paperback of With the End in Mind will be published on 7th February 2019. I am delighted to reveal the paperback cover: the cup of tea is such an important part of those tender conversations about death, dying and preparation. I’ve lost count of the number of cups of tea I have shared with patients and families over 30 years in palliative care. This tiny ritual converts a consultation into a conversation. We can be frank. We can shed tears. We can be human. We can mourn lost hopes; we can begin to plan new ones. I hope that the paperback will prove as popular and as helpful as its hardback Big Sister, and be more accessible at a lighter weight and a lower price. The ebook is for sale here, and you can listen to an excerpt and read some of the stories on the web-page without purchasing. I was delighted to be invited to speak at Hospice UK’s 2018 Annual Conference in Telford. Around 800 delegates attended, from palliative care services based in hospices, hospitals and community settings. The varied programme considered the needs of patients, family/carers and professionals. We heard about research, theory, practical action, service planning, politics and inclusivity; we met old colleagues and made new friends. There were workshops, lectures, posters, stalls, information and a cartoonist! Lots to think about. 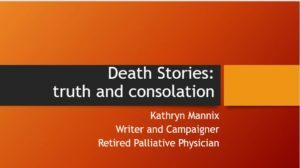 I gave the end of conference address: Death Stories. It was live-streamed and posted on Facebook, and can be viewed here. Spoiler: it mentions death, dying and the human condition. And the Little Mermaid. 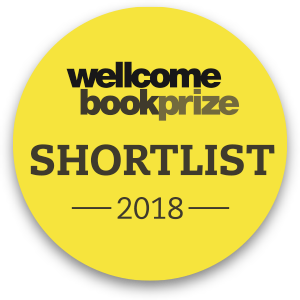 Five of the six shortlisted authors for the Wellcome Book Prize gathered in London for a festival of writing related to medicine, health and the human condition. The imminent birth of Mark O’Connell’s next baby prevented him from joining us, but the women of the shortlist enjoyed an ‘Authors in Conversation’ session at The Wellcome Collection on Saturday 28th April: Bookish Beck has written a summary for her blog here. On Sunday 29th April, we were all together again for a ‘5×15’ event, this time at Cecil Sharp House. Each author spoke for 15 minutes on the inspiration behind her book. You can click on each author’s presentation here and on Mark O’Connell’s (made at an earlier event) here. Here’s me, talking about why we need to get real about dying, a 500 year-old tree and a coffin shop in the Andes. Then there was a Prosecco and canapes event to announce the winning book on Monday, 30th April: congratulations to Mark O’Connell, whose ‘To be a Machine’ won the prize. 2.6 million views of ‘In my humble opinion’ video! BBC Ideas asked me to talk about what we misunderstand about the dying process, for their In My Humble Opinion video series. It’s a very short video, so lots more to be discussed – which is what ‘With the End in Mind’ is for.